As many of us know, the continuing rise in development and gentrification in Tacoma has pushed more and more residents - especially low-income residents and residents of color - towards displacement and forced relocation from neighborhoods where they have long lived. 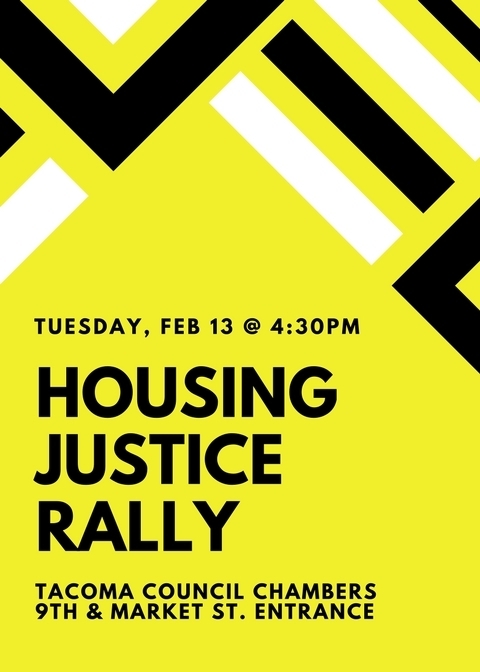 Join us to rally in front of the city council building on Tuesday, 2/13 at 4:30pm in a visible call for local government to address housing and social injustice! The rally will be followed with our collective attendance at the City Council meeting, which begins at 5pm. The Citizens' Forum will also be held during this council meeting and we encourage community members to testify and call on the City to take action for housing access and justice! You can follow this link for more details on the 2/13 meeting agenda items, once they are released. In the meantime, stay tuned for talking points and updates on our event page here. Please join us and spread the word!